March 30, 2018, 6:05 PM · Virtual reality (or VR) has been around for several years, and theme parks have been trying various ways to incorporate the technology with mixed results. The prospect of immersing guests into a new world without the need for dozens of screens, costly and inflexible props, and difficult to maintain animatronic figures has been something that has intrigued attraction designers and riders alike. Giving guests VR headsets on roller coasters to enhance, improve, or refresh the ride experience was a trend that exploded a couple of years ago, but dreadfully slow ride operations, poor graphics, and heavy, uncomfortable headsets with questionable cleaning procedures proved to be difficult hurdles to clear that caused the proliferation of VR to decrease in the past year. 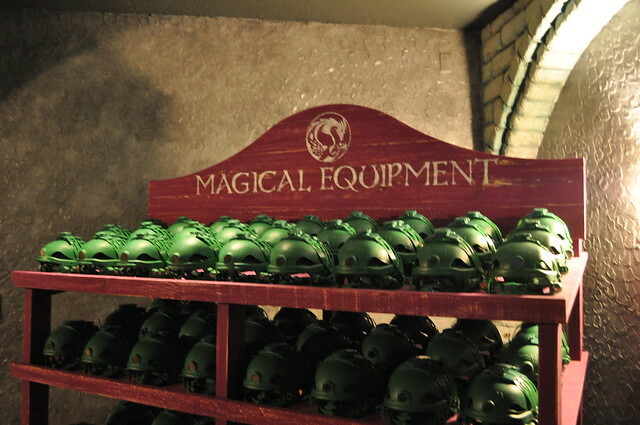 Busch Gardens Williamsburg is attempting to reinvent and revolutionize the application of VR in theme parks with Battle for Eire. The park's newest attraction is the world's first use of VR on a theme park motion simulator. Battle for Eire takes the place of Europe in the Air in the Ireland section of the park. The old ride was retired at the end of 2016 to allow time to convert the park's 2 motion simulators to accommodate the VR technology. Now, you might ask why it took over a year to simply allow for guests to wear VR headsets on a standard motion simulator. The biggest problem with VR is that loading/unloading guests and ensuring the VR is working correctly can be a difficult and time-consuming process. Busch Gardens engaged with Dreamcraft Attractions to come up with a solution to this critical problem. The result is that the actual headsets are not handed to guests before they board the ride (or even after they've sat down), as has been standard practice on pretty much every VR attraction. Instead, guests are given a peculiar mask that looks like you're getting ready for a masquerade. The masks are worn similar to a hard hat, with a ratcheting mechanism that fits around the back of your head. Larry Giles, BGW's Vice President of Engineering, and Mark Stepanian from Dreamcraft noted that they went through at least 10 working prototypes before settling on the final design that can accommodate just about any head size and shape. There are no straps across the top of the head, which allows those with buns, ponytails, braids, dreadlocks and other rigid head styles to put on the mask without having to rearrange their hair. A few turns of a knob on the back of the mask is all that's needed to create a snug fit. I did notice that guests with unusually long or broad noses might have some slight discomfort with the molded nosepiece of the mask, but for me personally, the mask was quite comfortable. For those wondering about hygiene, the masks are made of special plastic and foam materials that are designed to not absorb body oils, and each mask is sent through a sterilizer after use, much like 3-D glasses, and not subject to the manual baby-wipe technique often used to clean VR headsets on other attractions. Based on the number of masks they have and the expected throughput of the attraction, BGW expects each mask to be used 2-3 times each day. The mask is quite clever, and enables BGW to speed up the loading and unloading process significantly as guests are given their masks well before they reach the simulator. There are 2 pre-show rooms prior to boarding, where guests can put on their masks and make sure they are comfortable. The other unique aspect to Battle for Eire, compared to most other VR attractions, is that the headsets are mounted and tethered to the simulator itself. By doing this, ride operators can focus on getting guests on and off the attraction instead of handing out and synchronizing headsets. Guests enter the simulator, and can see where they're going since they don't put on the headset until they're sitting down and buckled into their seat. The headsets themselves are placed in cradles between each seat at eye level, so guests simply reach over to the right, pull the headset out of the cradle, and snap it in place. The headset mounts to three metal tabs on the mask magnetically, so it's virtually impossible to not get the headset attached correctly. The strength of the magnets is more than enough to prevent the headset from accidentally falling off, even if you move your head wildly. Guests are advised to remove any prescription glasses prior to putting on the headset to avoid scratching their lenses, but smaller frames could probably be worn without much trouble. The headsets are quite light, and do not have the unbalanced feeling of some VR headsets powered by bulky and heavy mobile devices. The other advantage to mounting the VR headsets to the ride is that the image quality within the virtual world is not limited by the size and power of the device driving the VR headset (usually a cell phone), and because they are always tethered to the attraction, the headsets never have to be charged, and synchronize with the on-board computers flawlessly. In fact, each individual headset is driven by its own powerful mini-computer mounted beneath each seat, allowing graphic artists the ability to render the Battle for Eire in high definition (1080). Technically, I have a hard time thinking of a better, or more efficient way to incorporate VR onto an attraction. It's really quite ingenious. Once all the technological and logistical challenges were solved, Falcon's Creative Group was then given the task of developing a story for this new attraction and rendering the high definition images in a 360-degree virtual world. Designers settled on a story that wove together many existing Irish stories and myths. The result is a fairly straightforward good versus evil narrative, where Addie, the last remaining fairy of Ireland, must protect the Heart of Eire from Balor, a one-eyed dark lord that has converted all of the fairies into his minions called Sluaghs. Riders are part of the action, and follow Addie as she takes us through The Otherworld. When developing the images for the attraction, Falcon's Creative Group created a virtual world that included the position of the simulator so those data could be fed back to BGW's engineers to program the actual motions on the ride. To me it felt like the actual movements of the simulator were far subtler than in previous incarnations (Questor, King Arthur's Challenge, Corkscrew Hill, and Europe in the Air), probably because the VR enhances even the smallest movements. Gone are the herky-jerky motions you experience on most simulators trying to give guests the impression they're falling or flying. With VR, the images do most of the work, tricking your body into thinking you're coming face to face with a dragon, with just a few small motions needed to convince your mind that you're really there. The smaller movements make the ride far more accessible to guests that get motion sick and those smaller guests that may not be ready for a really bumpy ride - the ride still has a 42-inch height requirement, and there is no age restriction to experience the ride in VR, though if guests choose, they can ride without the headset and watch a 2-D version of the ride film on a flat movie screen. So, you're probably wondering, how is the actual ride? I thought it was a solid improvement over most simulator attractions. Falcon's Creative Group did a really good job creating an immersive world with lots of things to view outside the most obvious forward-facing sightline. The quality of the graphics is far superior to any VR attraction I've ever experienced, but it still feels like you're in a cartoon with textures and landscapes that at times lack the realistic quality of modern computer animation from the likes of Pixar, Blue Sky, or DreamWorks. Also, the story itself was lacking depth, understandably difficult to do over a five-minute ride cycle, and it has the same issue that Corkscrew Hill did with character dialogue that's occasionally difficult to understand through the thick Irish accents. Battle for Eire is in a very interesting position; the design and technology are on the bleeding edge, but it's arriving behind the times with the use of VR on theme park rides already past its apex. Being so advanced could mean that the rapid improvement in technology could lead Battle for Eire to be easily topped by another ride investing in bigger, more powerful computers. With the throughput problem of VR solved using the mask/ride-mounted headset arrangement, BGW now has the tough task of upgrading the graphics as technology rapidly improves. Considering that BGW could no longer find a way to operate and maintain Curse of DarKastle, I wonder if they will be able to keep Battle for Eire up to date with technology that progresses exponentially with every new cell phone release. For now, the experience is a solid one that is a significant improvement over Europe in the Air and most other "gimble box" attractions. It may not be a must-do-every-visit kind of ride, but may eventually be recognized as a landmark attraction that serves as a prototype for VR to truly become a viable theme park technology. BGW has not officially opened Battle for Eire to the public, but expects the attraction to open in April. Interesting. It sounds like BGW got a lot right with this attraction, and while I am sure the video doesn't do the live experience justice, it seemed quite enjoyable. I am anxious to try it out myself - but I will have a very hard time visiting BGW and not getting to ride DarKastle. Total choke closing that attraction down and replacing it with...nothing. (Man, I forgot all about Corkscrew Hill - that was a very unique and fun adventure - I miss it!). just more proof that Cedar Fair continues to knock balls out of the park while the others do this stuff. What does it take for parks to learn what people want. Twisted Timbers is now in battle for the best ride in va with i305. Both in the same park. Wake up people!!!!!! It does sound like a lot was done right at BGW ... but the real world experience may be very different. Case in point - Kraken VR at Sea World Orlando last year. The bloggers endlessly gushed over how fantastic it was. Actual experience - it mostly sucked, from the agonizing load times to the ill-fitting headsets that provided a hit or miss audio and visual experience. Oh, and it made some people motion sick. My personal opinion of VR attraction overlays are that they are a cheap way to create a short-term splash for marketing. With Kraken VR in Orlando, the word quickly got out that it wasn't that good. Before VR was removed from Kraken after only about 9 months in operation, I was routinely seeing less than half of the train opting to use VR. FWIW Jeremy, Battle for Eire was built from the ground up, so I wouldn't necessarily compare it with a coaster overlay. The motions of the simulator were derived directly from the video (not the other way around), and are pretty subtle, so the chances of motion sickness are much less than a poorly synchronized VR experience on a coaster that doesn't always go through its course at the exact same time and speed every single cycle. As far as the load issues, I think BGW has found the solution here with the mask/vehicle-mounted headset. I think there may be some growing pains at first (probably related primarily to ride-ops making sure all of the headsets are on and synchronized), but once they get the hang of it, I think it will be a pretty seamless load process. As far as the experience as a whole, I don't think Battle for Eire is the groundbreaking attraction that will get every park in the country looking to install a similar ride, but will be the breaking of the ice after guest perception towards VR had grown frigid.